Growing up in San Diego has exposed me to endless opportunities to be out in the wilderness and experiencing nature. I am a high energy girl with the need for adventure! At a very young age I was surfing, camping, hiking and enjoying water sports with my family. Camping was a joy, because I got to spend quality time with family, friends and be out exploring all that nature had to offer. I became addicted to the feeling of being grounded, The fresh air, beauty of nature, and learning that my mind and body is capable and willing of going the distance. As a young adult I had the thrill to hike Machu Picchu!! What a spiritual experience that was. From that day forward I couldn’t wait for my next hike or surf expedition. My life now is busy with 2 boys and a husband that lets me be me!! I feel that balance is the key to life and when I am taking moments out of my busy days, doing the things I love, with people I love, then everything seems to make sense. I am now sharing this passion with my boys and want them to experience the feeling of what it’s like to be one with nature. I am truly honored to be a part of Foster the Earth and look forward to memorable experiences. Sierra Nevada Mountains, I learned at a young age the importance of spending time in nature. My bond with nature grew when I moved to San Diego for college and quickly discovered surfing. Between camping trips and surf sessions I earned a degree in Film Production and have worked ever since as a filmmaker and photographer, primarily working in the outdoors and adventure industry. Born on the east coast with fisherman blood, the ocean has always been a big part of my life. With a marine geology degree in tow, I moved to the west coast in 2008. Over time, I found myself instead working in marketing production for the sports industry and spending less time in the water and more time in the woods. Although the ocean will always be my first love, the mountains are when I see my reflection best. The more time I spend in the wilderness, the more I learn about myself. I enjoy any chance I get to hike from local San Diego trails, desert trips, PNW rainforests, crossing Rim to Rim to Rim of the Grand Canyon, trekking portions of the PCT and summiting Mt. Whitney and Half Dome. These trips, no matter how large or small, have been fundamental in forming closer bonds with people and making me a happier, stronger, more aware person. I look forward to sharing adventures with FTE and watching others form their own connection to the wilderness. I was born and raised in Encinitas, CA on the beach. I had my first experience in the mountains when I moved to Colorado in my early 20s and was instantly hooked! My time exploring the backcountry opened up my world to what types of adventures were available in my own backyard. It provided a platform that allowed me to escape the noise of everyday life and build my self-confidence to heights I had only dreamed of before. I eventually became so hooked that I decided to leave my corporate job to hike the Pacific Crest Trail. At the time I had literally no prior experience backpacking but figured why not, it's just walking! Now that I have completed the PCT, my goal in life is to never stop exploring the world while enthusiastically encouraging others to grow through outdoor recreation. I grew up in Carlsbad, CA where I spent most of my days on the beach and in the ocean—my true happy place. I caught the travel bug at an early age which led to a four year stint on the east coast for college, half a year in Denmark, country-hopping through Europe, and hitch-hiking across New Zealand. Eventually, I landed in San Francisco where I worked in tech and became a “city” person for three years. San Francisco was a rad place, but city life just wasn’t for me. I spent all my weekends outside the city, along the coastline or in the mountains—running, hiking, camping—or visiting my boyfriend Zach in Colorado. There, we explored the Rockies and even hiked some 14-ers together, which was a blast! Together, we experienced the healing power of nature and fell in love with the outdoors. Eventually, when we burnt out on our corporate jobs, we decided to do something totally different (and a little crazy): hike the Pacific Crest Trail. We leveraged our PCT hike to raise funds for a charity similar to Foster The Earth, and instantly realized the value of giving back. It is my passion to encourage and help those around me to get outside, try something different, and learn something new. I’m stoked to be back in San Diego as a part of the FTE team where my peers share that passion and are devoted to helping everyone achieve their dreams! Jamie Zumbro was born in Mammoth Lakes California. Needless to say the Sierras were in her backyard. As a child Jamie did some hiking but her main passion was riding horses. In 2013 Jamie summited Mount Whitney which really opened her eyes , mind, soul, and the love for the backcountry. Since summiting Mount Whitney she also summit Mount Langley,and Mount Tyndal. Both mountains stand tall in the Sierras. In 2017 Jamie backpacked Joshua Tree and in 2018 she backpacked Catalina. Jamie is section hiking the Pacific Crest Trail which starts at the boarder of Mexico and ends in Canada. She currently lives in Encinitas Ca, with her husband and 2 kids Logan and Zoë. As a family they love hiking , backpacking, fishing, going to the desert and being around friends and family. Jamie currently rides and breaks young horses in Rancho Santa Fe. On her spare time she loves to be out in the wilderness where she feel free. 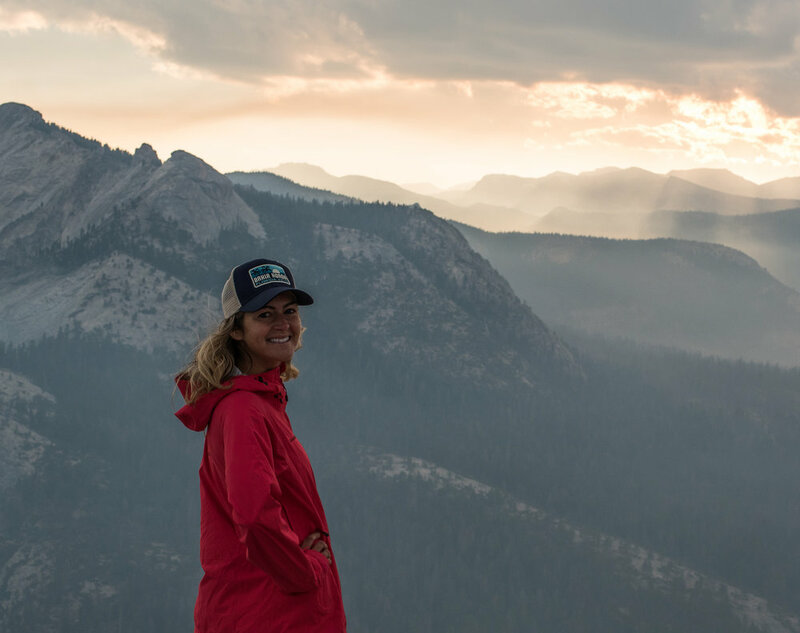 After six years as an NBC News Reporter, Liz left to hike the Pacific Crest Trail. From April to August, Liz hiked an average of 20 miles per day and gained the trail name “Wild” after fellow hikers continuously commented on her resemblance to Reese Witherspoon. On the trail, Liz discovered we are meant for more than climbing the work ladder and accumulating items from shopping malls. In 2017, Liz began adventuring and living full-time in her Mercedes Sprinter. She traveled throughout the United States and Canada - accumulating 50,000 miles. Her favorite place? Tahoe and Southern California. However, Utah rock formations blow her away. Liz loves every single outdoor sport - biking, running, skiing, hiking, climbing, and surfing.